I step into the pouring rain an hour before my class with Elizabeth Andoh should start. It’s my first day navigating Tokyo streets and metro on my own, so I want to give myself plenty of time. I can’t remember the last time I found myself in the middle of a large city caught in the rain. I love the coziness of watching from under the huge umbrella the intense tempo and glitter of Tokyo. I find Roppongi where I am staying with my friend Junko both gaudy and delightful at the same time. It’s as opposite in feel to my small town of Natick, MA as it gets without leaving this planet. You don’t need to meet Elizabeth to know that she is detail oriented and dedicated to her students with every fiber of her being. One look at her phenomenal metro directions and you know this woman was born to teach. She clearly explains every line change, station layout, and warns you when to get on the local vs. express train. It’s all going well until I get off the escalator before my last train change. The train is at the station with open doors. I quickly check the direction and hop in not to miss it. The second the doors close I realize that it’s an express and it will go past my stop. I try not to panic, get off at the next stop and find the train that goes the other way reminding myself it has to be a local. When I get to Elizabeth's stop, it’s pouring even harder. I am trying to hold the umbrella with one hand and directions with the other. It’s raining so hard I can’t make out the names of the streets. After a few false starts of walking in the wrong direction, I finally get myself oriented. Finally, finally I find Elizabeth’s building, soaked to the knee, clutching dripping directions and completely out of breath. I call Elizabeth’s apartment and get buzzed in. In the elevator, I think of all the times my students were late to my cooking classes and feel terribly embarrassed. Something tells me I’ll be a bad student. For a control freak like me, it’s very hard to be on the other side. I am bad at following directions. I am even bad at showing up on time. Natalia greets me at the door with a huge reassuring smile. She and Lauren are Elizabeth’s assistants. I get out of my dripping coat, shoes and socks and run into the kitchen. Elizabeth greets me warmly and we hug relieved that after 4 months of planning I am finally in her kitchen. Elizabeth Andoh is not just a cook, a writer, and a teacher. She is a force of nature. Her energy and enthusiasm for sharing Japanese culture and food are palpable. No detail is overlooked. The kombu comes out of the water at 80C (at the first suggestion of a simmer) to avoid a tannic dashi. The sesame seeds are toasted right before serving and ground still warm for the most potent aroma. The miso gets mixed into the soup at the very last moment. The cucumber is rubbed to remove bitterness. There are reasons for every one of these techniques and Elizabeth patiently explains what Japanese cooks have known and practiced for hundreds of years. There is no question that she has more respect for tradition than innovation. My loyalties lie the other way around, yet I can’t help but soak in her wisdom. We spend 3 days cooking, shopping, and eating the fruits of our labor. We taste non stop: all different types of vinegar, miso, seaweed, soy sauce, spices, vegetables cut with the grain vs. across the grains. Don’t laugh. It makes a huge difference. I am not surprised about the texture difference. But there is flavor difference too. Across the grain is milder and juicier since more juice is released. With the grains is less juicy and more spicy. We discuss traditions, cookware, serving pieces, and our restaurant experiences. For 3 days we immerse ourselves in Japanese food and culture completely and try to understand what makes it tick. The presentation and symbolism of both ingredients and serving ware is fascinating. Every meal must offer 5 colors, 5 flavors, and 5 cooking methods. Ideally, it should show off some ingredient that is at its prime, some ingredient that is about to become at it’s prime (the ingredient you just can't wait to cook), and some ingredient that is on the decline (think tomatoes at the very end of the summer when you just can’t let them go). The ceramics must reflect the season and even the weather. On a sunny day when Mount Fuji is in sight, Elizabeth uses Fuji chop stick rests. Since the rain is still pounding the windows as we sit down to our first meal together, we opt for ginkgo leaves, persimmons, turnips, and other fall themed chop stick rests. Elizabeth’s ceramics collection is bigger than some of the local stores, so there is no shortage of options. One thing I find peculiar is that Japanese cuisine has a tendency to combine what seems like a crazy cornucopia of mismatched plates, bowls, textures and flavors and present them to the diner all at once (at least for obento type meals). Intuitively, it seems that such an approach would result in a cacophony, but somehow the total ends up greater than the sum of its parts. Japanese have an interesting approach to saltiness and sweetness. Since all 5 tastes including sweetness need to be represented throughout the whole meal, the level of salt and sugar barely changes as you move from the main meal to dessert. Elizabeth explains to us that the presence of sugar in all food satisfies people’s natural craving for sweetness and reduces how many desserts people consume on regular basis. I like this theory. I am also delighted that many desserts in Japan are made out of beans and vegetables. It has nothing to do with their health benefits, I just love beans and veggies more than I like caramel and butter cream. The amount of food we produce in 3 days is phenomenal. Daikon radish is carved to resemble chrysanthemum flowers (part of our autumn theme). They are first simmered in starchy water left over from rinsing rice to improve their flavor and then simmered in dashi. Little turnips are pickled in rice bran with persimmon peels and other spices. Buri's belly is mouthwatering -- like eating bacon of the sea. Sushi rice with chrysanthemum petals and a sliced thin omelette shaped to resemble a flower (kids, don't try this at home with the flowers you get from a florist -- they are treated with chemicals). The omelette is made in a rectangular pan. It's not that different than making a crepe. A chop stick is the best way to flip it. Shiitake stuffed with chicken, shiso leaves with miso walnut stuffing, spinach with tofu walnut sauce. Little turnips cut to resemble chrysanthemum flowers and pickled in sweet and sour sauce. The yellow comes from gardenia pods; the pink from akajiso (red shiso). These were my favorite pickle! 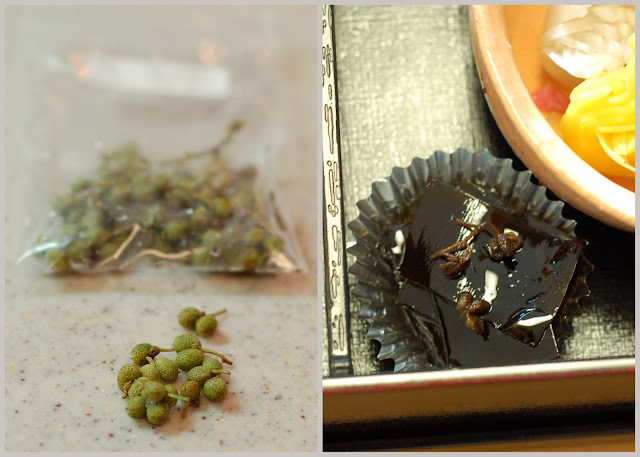 The picture on the left is sansho berries (mistakenly called "pepper") that Elizabeth picked and froze. We used them in the kelp relish (on the right). This was the most fascinating ingredient discovery of my trip. It tickles! I've never experiences this sensation in my mouth before. I brought a bag of pickled sansho berries with me from Japan, but once I run out, I am at a loss. If you know where to get them in the US, please let me know. We put kelp, maitake mushrooms and a dash of salt into teapots, steamed them to release the aromatic mushroom broth and served with a squirt of lime. First you pour the liquid into a little cup and drink it like a soup and then you eat the mushrooms out of a teapot. There is something irresistible about soup served this way. Quick pickle of cabbage, cucumber, and myoga -- my other ingredient discovery from this trip. Myoga is a relative of ginger. It tastes like a cross between ginger and shallot. Various pickles. The yellow radish was butterflied and stuffed with shiso leaves -- very pretty and yummy. Daikon quick pickle dressed with miso mustard sauce (very tasty and versatile) and sliced shiso leaves. Domo arigato gozaimasu (a huge thank you) to Elizabeth for her hospitality, charm, ambitious class planning, and encyclopedic knowledge of Japan; to Natalia and Lauren for dish-washing efforts of herculean proportions; and to my fellow students -- Christina from the US, Dagmar from Germany, and Chris from Australia -- for their curiosity and passion for Japanese food. I've always thought Japanese food was perfect. Now that I've been to Japan, I know it is. This was a great post. Thanks for sharing. OMG...that looks awesome! I'm really going to have to make it to Andoh's class. I think another name for shanso berries is sichuan peppercorns. I've never seen them green like that, but the brown ones look like the ones I've used from chinese markets. Swing by one of the places in Boston sometime and you'll find it in the spices aisle. From what I was able to find out by googling, Sichuan peppercorns and sansho are from related plants, but they are not quite the same. Another big difference is that I've only seen Sichuan peppercorns sold dry and the sansho we used was fresh. Maybe that's why it's green. I am guessing it might change color if it's dried. Incorrect use of the possessive apostrophe. You are absolutely right about "hundreds"
I did bring some vacuum sealed sansho berries with me. I believe they are pickled, but haven't tried them yet. Will need to do a comparison with sichuan peppercorns sometimes. Thanks for the Sichuan Gourmet recommendation. I live really close, but haven't been yet. wow! i'm always amazed by the Japanese food presentations.